One of my favorite times in Washington, D.C., is when the cherry blossoms reach out to say hello to all of us. Another is when these delicate petals fall, leaving a textured pink layer over grass and pavement. D.C. residents knew the blossoms were preparing to take their leave. The downed magnolia petals gave us warning, as did emerging redbud, and the green leaves that began to eclipse the presence of pink on the cherry trees. 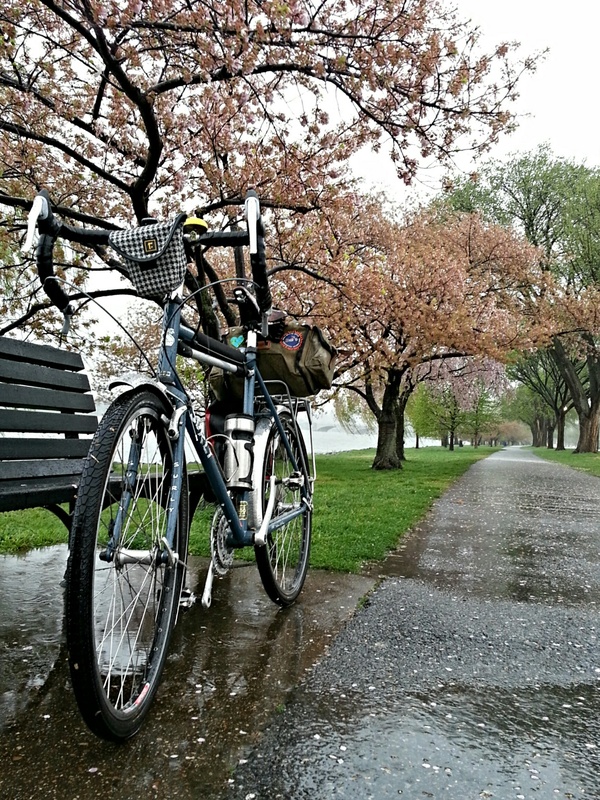 Despite the steady rainfall, I departed for work by bike, hoping for quiet streets and a glimpse of the petals’ farewell to the city. The rain cleared the roads of tourists and left only the most dedicated of bike commuters to contemplate the quiet, warm, damp of the morning. 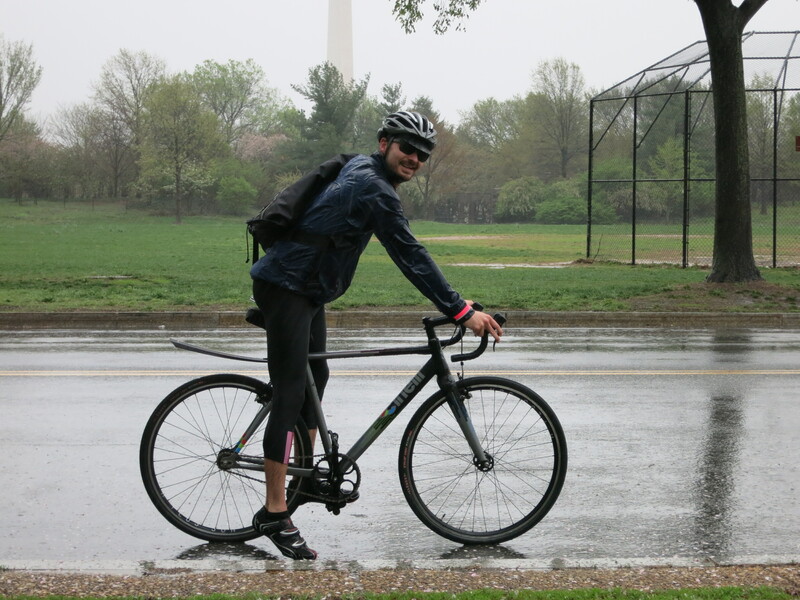 I steadily pedaled toward the Tidal Basin and Ohio Drive, seeking out a special spot. I didn’t know where it was, only that I would know it when I came upon it. 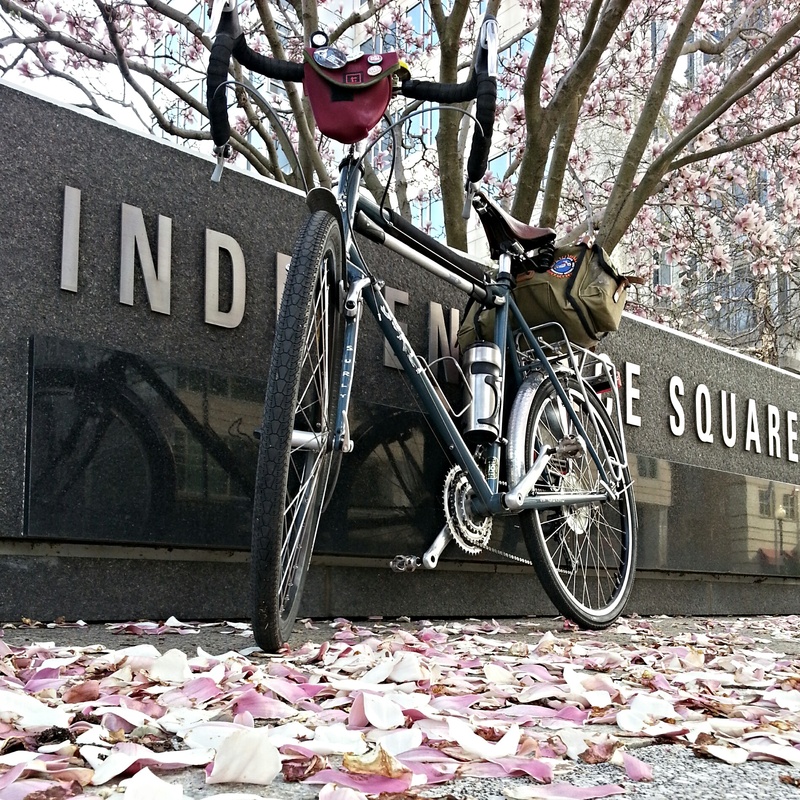 I passed over petals, puddles and pavement until my bike steered me toward a tree peppered in tiny pink ovals. My special spot. Propping my bike against the tree’s solid base, I soaked in the morning. Yes, like that. As I was taking photos, my friend Chris rode by. I said hello, thinking he would simply continue on his way, given the rainy morning. To my surprise, Chris turned around. 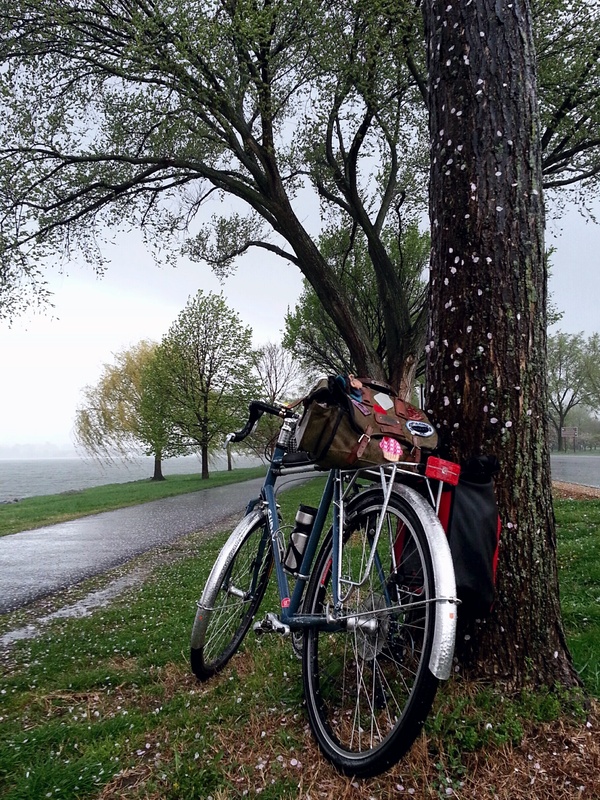 We exchanged photos, chatted a little, and contemplated the morning rain by the Potomac River. I took a few more photos, Chris pushed off, and I hopped on my bike to bid Ohio Drive goodbye. Suddenly the wind rushed, clouds fused, angry waves licked the shore of the Potomac, and the previously steady rain morphed into a pounding downpour. My feet squished in my socks and shoes, and I wondered what the hell I’d been doing, pausing my commute to grasp that moment. I imagined Chris crossing the 14th Street Bridge. What were we thinking? But the stormy beauty of the day brought an unrepentant smile to my face. Morning’s warmth and a peaceful moment with a friend and fellow bike commuter. My immediate view of the storm’s intense rising over the river, the swaying of trees, and the flurry of pink petals intersecting my path. The intense pre-work soaking was well worth it. Farewell, dear blossoms. “what were you thinking”, perhaps the same thing I was an hour plus earlier as I left Arlington on my way over some of the same pathways you traveled..the rain or should I say mist of the morning was highlighted by the bike light .. and slowly dissipated as the Pentagon pasted on the right. Onward with a quick cycle on the paths in Lyndon Baines Johnson Memorial Grove, hooking the circle with the Navy – Merchant Marine Memorial on the left, and over the 14th Street Bridge. Yet another hook to the left and the Jefferson on the right, I could shorten my route but way be in a hurry. Your story of the fallen petals, the passing of springs reminder of a summer in front of us and the winds…. 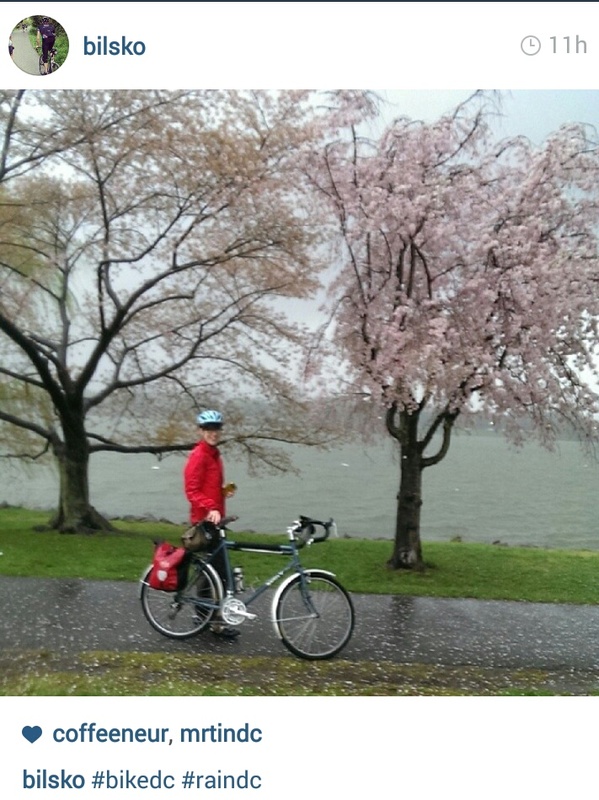 “what were you thinking”, you captured those thoughts in one picture, your bike, the empty bench, the happy trees and no one in sight…..thanks for sharing your CBF, short for Cherry Blossom Farewell. Thank you so much! Funny how “what were you thinking ” can suddenly take on such a positive significance, no? Good post, MG. One of your best. Well spoken! “what were you thinking?”. One of those special times that all of us who commute get to enjoy! Yes, until recently I’d forgotten about the simple beauty of the morning commutes.